This week, New York’s Film Forum is screening Alfred Hitchcock’s “Dial M for Murder” in its original 3D. Shot in a format called “Natural Vision,” the movie takes on new dimension when seen this way, and it was a distinct pleasure to watch it with an audience. Hitchcock used 3D to great effect, but also sparingly. Mostly, it adds depth to the action, rendering scenes so that some objects seem to be very close to the viewer, creating an effect that’s almost like watching a movie in a lenticular. Hitchcock shot most of the movie in the single set of the Wendice’s tiny apartment, looking up at the action from a low angle to amplify the feeling of dread. 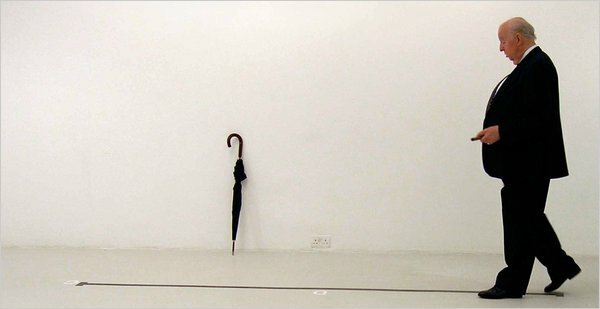 Lamps and other objects sit in the extreme foreground, creating barriers between various characters. 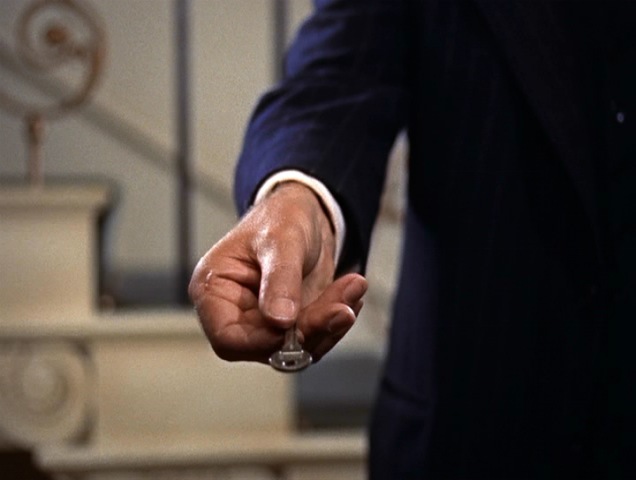 Only a few times does Hitchcock deploy 3D for that “it’s coming right at you” effect, in scenes when Margot (Grace Kelly) reaches for her scissors to fend off her attacker or, later, when her husband puts a key in the lock to try and open the door. It also allows the credits to stand out during the opening sequence. It was also a revelation to watch the movie with an audience. When I wrote about the movie here, I felt that its humor took a back seat to suspense. Seeing it this week, though, I laughed along with the crowd at Wendice’s insanely convoluted scheme and his pretense of innocence and at the too-convenient reunion photo on his wall. John Williams’ hammy acting broke up the crowd as well, particularly his moment of preening at the end, after he’s solved the case. Director Johan Grimonprez concocts a strange homage to Alfred Hitchcock in “Double Take,” a film that’s fascinating in both construction and intent. 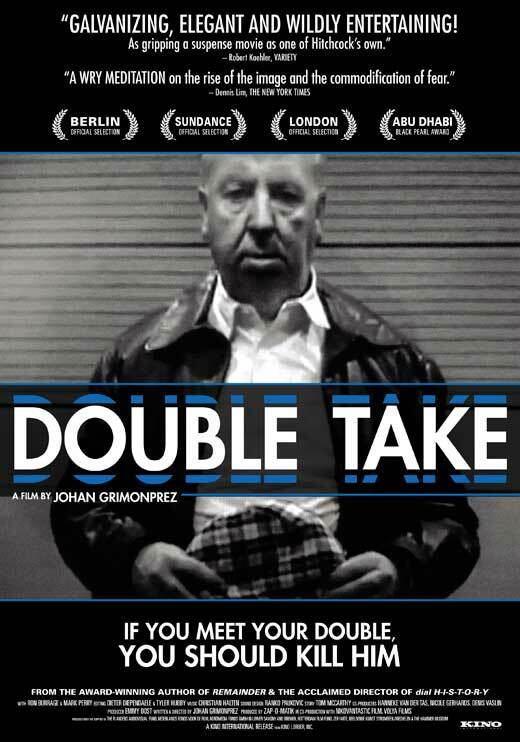 Working with a British Hitchcock look-alike, a Hitchcock vocal impersonator and archival footage, “Double Take” presents a tale of the Master of Suspense’s troubling meeting with his own twin. Set in 1962, during the making of “The Birds,” the film segues from Hitchcock’s intros to his own TV series to the double, shot at a distance and on grainy film stock, to images of Hitchcock’s film cameos edited together so that the Hitchcock of one era meets the Hitchcock of another. But the film has bigger ambitions than telling a disturbing story of a famed filmmaker. The scene shifts; gray, static-filled images blur and refocus, and now we’re watching the encroaching dread of the Cold War era. The U.S. races the Soviet Union into space while Nikita Kruschev debates Richard Nixon on national television. The Cuban Missile Crisis nearly destroys our world. 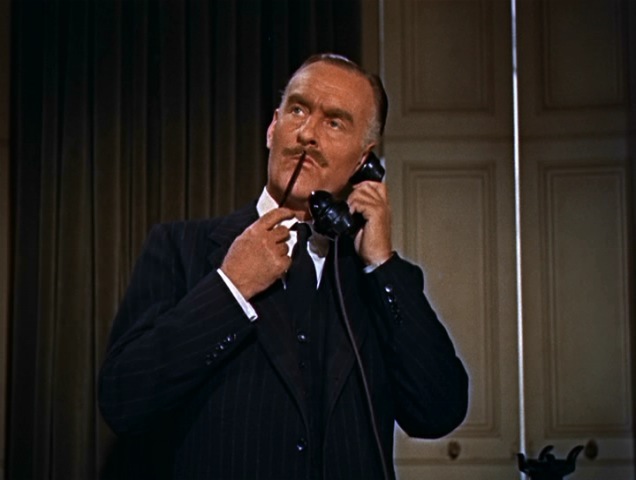 While these scenes from the evening news play on, many featuring Walter Cronkite, Hitchcock tells us more about his doppleganger. The voiceover never quite matches the images, blurring what we perceive and making it all a little more believable, plausibility be damned. There is Hitchcock again, releasing pigeons with Tippi Hedren in a publicity event for “The Birds” or, in my favorite bit of archival footage, riding a bicycle in circles circa 1930. Grimonprez revels in his movie’s sleight of hand, but like a post-modern magician, he reveals his own tricks even as he plays them. The movie starts with our vocal impersonator, seen in the studio, listening to tapes of Hitchcock and mimicking that slow, sonorous voice. The Hitchcock look-alike tells how he came by his trade; up close, he looks only a little like the Master of Suspense, but in the long shots, he almost could be the real thing. “Double Take” is a challenging treat for fans of Hitchcock or of arthouse movies, one that features not so much a plot as an impression of plot, and that is both a tribute to Hitchcock and a meditation on fear. Leonard J. Leff gives readers an intimate look at one of Hollywood’s most difficult partnerships in his 1987 book “Hitchcock & Selznick.” Loaded with detail culled from the filmmakers’ archives, the book creates a riveting portrait of the mismatched duo, including copious information on contracts, finances and memos, yet never loses sight of the very real men at the center of the story. The story begins in the late 1930s, as Alfred Hitchcock struggled to secure a deal that would allow him to relocate to Hollywood. But due to Hitch’s uneven track record and the uncertainty of European markets during wartime, only independent producer David O. Selznick took the bait. Selznick, then neck-deep in work on “Gone with The Wind,” signed Hitchcock to a lengthy contract, beginning with the Academy Award winning “Rebecca.” Selznick, ever the micromanager, insisted that Hitchcock stick to Daphne du Maurier’s original, best-selling novel, resulting in a movie that won acclaim and strong box office appeal but ultimately did not please the director. The balance of power slowly shifted over several years. As Selznick focused intently on one project at a time, he loaned Hitchcock out to other studios, including RKO, Universal and Twentieth Century Fox. Working for these companies, and for producers like Walter Wanger and Jack Skirball, Hitchcock was able to learn the Hollywood system at his own pace. 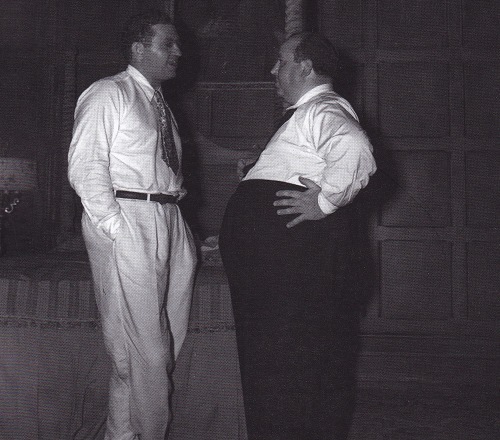 Selznick turned a tidy profit by loaning Hitchcock to other studios, a fact that Hitch came to resent. By the time Selznick at last found another project he wished to work on with Hitchcock, the director had gained an enormous amount of confidence, while Selznick had exhausted himself through his obsessive need to control every aspect of his own films – not to mention his use of pills to keep himself going, or his affair with actress Jennifer Jones. 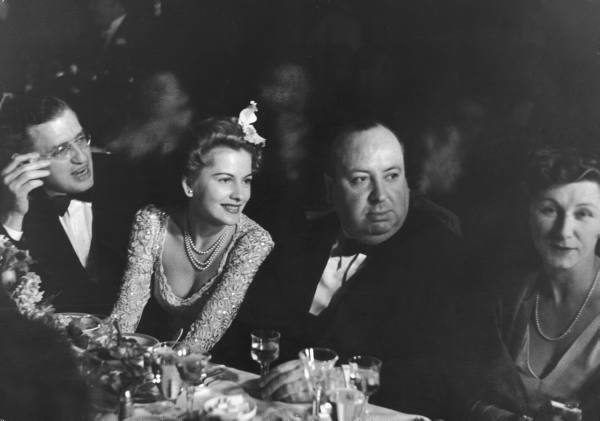 Hitchcock’s dislike of direct confrontations led to passive aggressive behavior; when it came time to sign a new contract with Selznick, Hitchcock would agree to the terms and but never sign the papers. 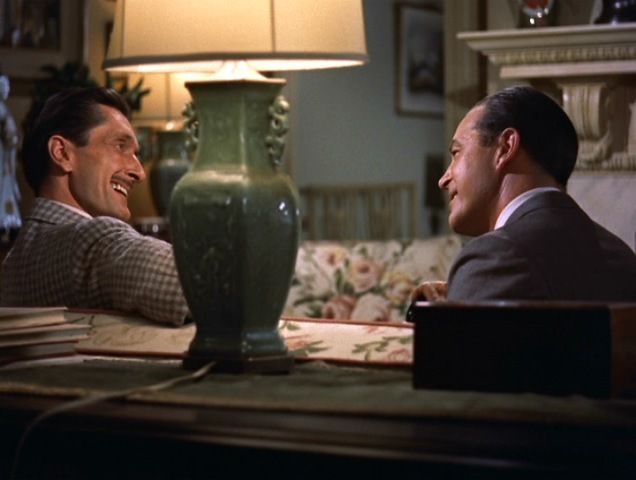 By this time, in the late 1940s, Selznick needed Hitchcock more than Hitchcock needed him. Hitch continued to direct for Selznick while working with his new partner, Sidney Bernstein, to create their new endeavor, Transatlantic Films. The four films Hitchcock made for Selznick are a mixed bag. Certainly “Notorious” is a classic, and “Rebecca” is a great film, if atypical for Hitchcock, but both “Spellbound” and “The Paradine Case” are seriously flawed. 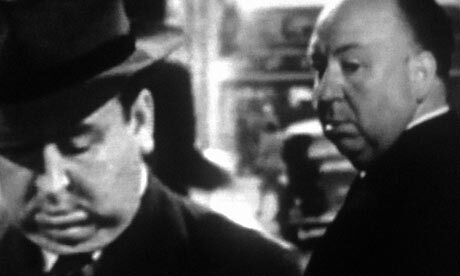 Hitchcock’s love of technical challenges clashed with Selznick’s need for character-driven stories, and it is in Hitchcock’s loan-out movies – “Foreign Correspondent,” “Saboteur,” “Life Boat” and “Shadow of a Doubt” among them – that we see Hitch exploring ideas that are of interest to him, not those foisted upon him by his employer.